I have good knowledge about these languages as I have developed the above-mentioned projects using these languages. I am always open towards new technologies and eager to learn them quickly. 1) Research on new Technology. 6) Proficient in Word, Outlook, Excel and Internet applications. An accomplished software engineer who love develop new ideas. Utilizes my capabilities and technical skills to bring out the best of me and to be active flexible in the ever-changing technical environment to be fully devote the exposure in the organization in which I will serve. Apart From Technical Skills i also possess Good organizational and interpersonal skills. 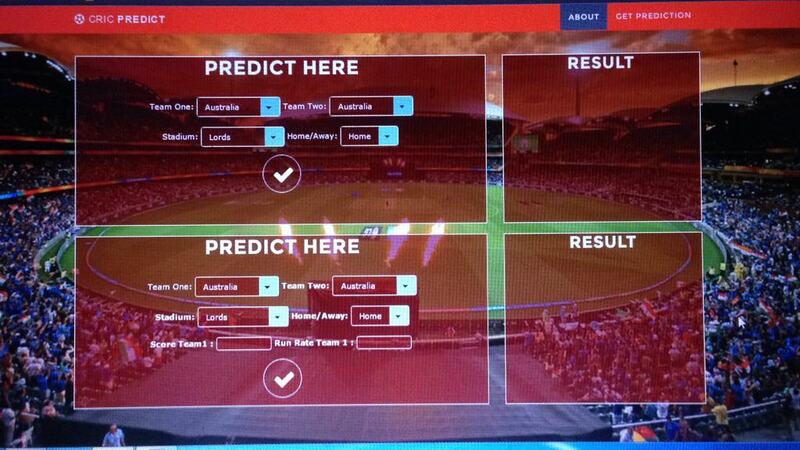 “CrickPredict” is the project which would help the user to efficiently predict the outcome of any One Day International cricket match. The system predicts the outcome of the match before it starts.Prediction is based on the historical data which is crawled from a well-known cricket website "CricInfo.com" which is a reliable source of cricket data. We worked on many features which might affect the outcome of the match. For prediction purpose, we are using classical machine learning algorithms which are Bayesian algorithm and Linear Regression The user just has to input team names and the Venue and the rest is our system's headache. SnapHit is an android based application. SnapHit Allows you upload your snap ,which is visible to other users, other users will rate your snap and at the end of the event winner will be decided on the rating you have got. SnapHit also Allows you to create an event. This project is used mainly for medical stores to maintain the details of the medical store such as stock and account.This medical shop management software is so designed as to ease the workload of medical shop professionals. The main feature includes inventory and stock control, accounting, client management. The purpose of the project is to come up with an electronic commerce system that is simple and secure for users. The system will provide means by which clients can view products browse for more information about the products, select items and collect them in the shopping cart then order or buy products online. This site brings convenience for our users is at the core of our every service. We aspire to build a singular platform that is your go-to option in any situation of your life. Be it ordering groceries, getting an appointment with the best doctors, buying tickets for movies, plays or musical concerts, flight updates, reading reviews, news, and discussions on a verity of topics openly and freely while respecting everyone’s freedom of speech and opinions. Data Tables based web application for real estate dealers where they can monitor their selling and buying. Project is in Progress.